If it can come up with all the beautiful music we've heard this evening, the world can't be all that bad a place. 2002: The Biggest!! The Best!! The Brightest!! Gilbert would be absolutely flabbergasted to know that a group of his friends has been meeting every year for 16 years on or about the anniversary of his death in order to have dinner and toast the memory of Gilbert's life. It was 18 years ago, on Bastille Day 1986, that he died. On the one-year anniversary, five of us got together for dinner. It was the five who had taken care of all the funeral arrangements--myself, his two best friends, Will and Henry, Henry's wife Willa, and Diana, who was the contractor for the orchestra for which he was the conductor. It seemed such a fitting way to mark his passing, one year after the fact, that we decided to make it an annual event, and to expand the group to include the people he felt the closest to. Tonight our group consisted of 15 people. Three other "regulars" wasn't able to make it. We met at a lovely restaurant in San Francisco, after a partially horrendous drive down from Davis. There was an accident somewhere that backed up traffic for about 20 miles, going at a snail's pace. Ultimately, however, we hit open space and continued on our way without further incident. Since the restaurant was in the western part of the city, the fastest way to get there was over the Golden Gate Bridge, now with toll raised to $5 (I remember being indignant when they raised it to 50 cents, from 25 cents!). 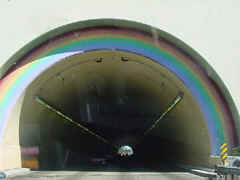 To approach the Golden Gate bridge from Marin County, you go up a hill and through a tunnel--known as the "rainbow tunnel" for the huge rainbow painted across its arch. As you emerge from the tunnel you get a view of the bridge that, at age 61, having seen it a bazillion times, still takes my breath away. It's beautiful in all weather conditions, even when the bridge is so shrouded in fog that you can just barely see the tops of the towers and the city is all but hidden. But on a day like today, when the air is crystal clear and the sky is blue and the sun is still shining...well..it just doesn't get any better than that! I was afraid we'd be late, having been stuck in all that traffic, but no, we actually were the third and fourth people to arrive. The others began to trickle in shortly afterwards. As the years pass, I feel more and more awkward at these dinners. In the early years, I was still a part of that world, the world of The Lamplighters, San Francisco music, and San Francisco theatre. I still worked with some of them in writing the annual shows. I knew the jokes. I knew all the gossip, knew all the people everybody was talking about. I loved getting together with the group. But as the years have passed, I find myself becoming more and more "country-fied," or perhaps more and more suburban. 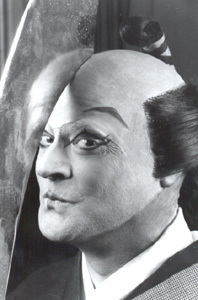 Walt still works with The Lamplighters from time to time, and still meets people at the opera. But I realize, as the conversation swirled around me, that I couldn't follow it any more. I didn't know the lingo any more. I didn't know a lot of people everyone talked about. I don't go to opera any more (actually I never did go to the opera and have stopped going to the symphony as well). I have sort of lost my interest in that world, in fact. Oh we talked and joked and laughed and told a few Gilbert stories and that was nice. I know that these are people who like me, and I do like them, but I had little to add to the conversation and couldn't follow a lot of it, and so I felt a little left out. I remember feeling this way the last couple of years, but it seems that the gap gets a little wider each year. We left the restaurant around 10:30 and had that long drive home to face. 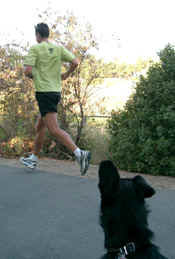 I took the first leg so Walt could sleep. The only problem was that I had had my fair share of wine with dinner. I have gone many years, now, without drinking anything, but have found myself slipping back into the habit again. Also my uneasiness at the dinner made me drink more than I would have normally. I think I had 3 glasses of white wine, over the course of the 3 hours, along with a lot of good Italian food. As I got behind the wheel of the car, it suddenly hit me that I wondered if I was OK to drive. An ad on the radio was reminding people to "drink responsibly." In years past that thought wouldn't even have occurred to me that maybe I shouldn't be driving. I thought about failed breathalizer tests they have given to people who thought they were OK to drive and wondered if I had just become one of them. But we had to get home and we'd both been drinking wine, so there didn't seem to be any alternative. I consoled myself with thinking how much I weigh and how as a large person, I should be able to handle that much wine over that long a period and still be OK. I don't drive at night as easily as I used to. The cataracts which are ripening in my eyes ("not ready yet," says the doctor) make lights from oncoming cars very bright. Under the best of conditions, I'm nervous driving in cramped conditions, and, for example, when you cross the Golden Gate Bridge with a barricade on your right and a steady stream of traffic on your left it begins to get into the "white knuckle stage." Then when you cut over from Highway 101 to I-80, along the long, dark, 2 lane Hwy 37, with headlights coming at you the entire way and no place to pull off and say "Wake up--it's your turn to drive," it gets even worse. At the very first opportunity, I pulled over, having now driven the requisite halfway home anyway, and let Walt take over for the rest of the trip. I'd like to say it as a wonderful evening. Parts of it were enjoyable. Parts of it weren't as enjoyable as they used to be. But it's nice to be with old friends again, even if you've grown apart, and it was nice to know that we all take a night to remember our friendship with Gilbert. And any night when I don't have to cook is a wonderful night from the get go! My "link of the day" (not necessary a regular feature, but this one is good). Check today's entry from A Queen of Infinite Space. This is the daughter of my friend Ellen and she's a damn good writer!